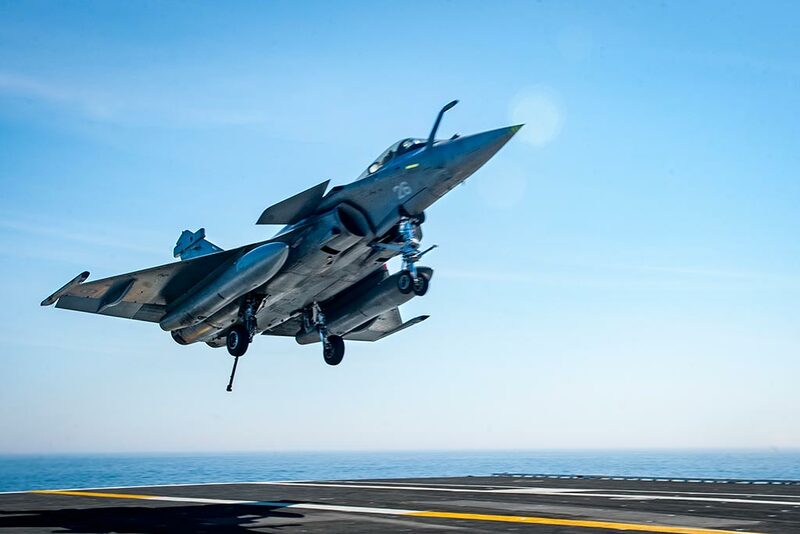 On May 18th, 2018 as the Rafale Marine launched into the distant skyline becoming the last French aircraft to depart from the aircraft carrier USS George H.W. Bush (CVN 77), Sailors on the deck celebrated a successful training operation and a job well is done, concluding the historic combined exercise Chesapeake 2018. 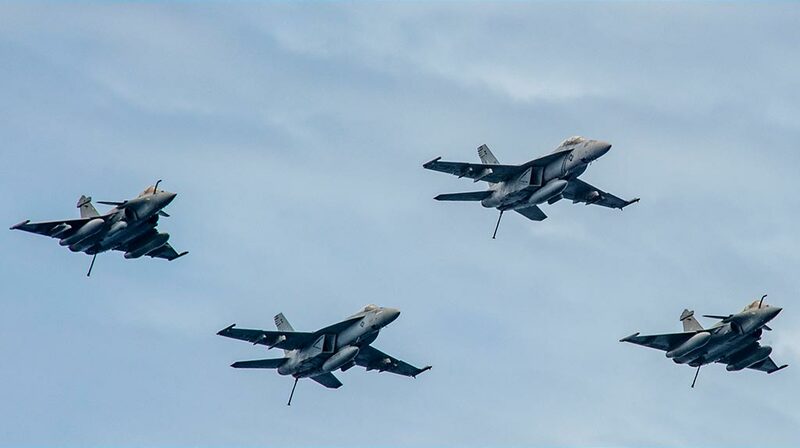 Chesapeake 2018 began in April at Naval Air Station Oceana and continued at sea, resulting in a full integration of the French Navy Air Wing into a single, unified carrier air wing. 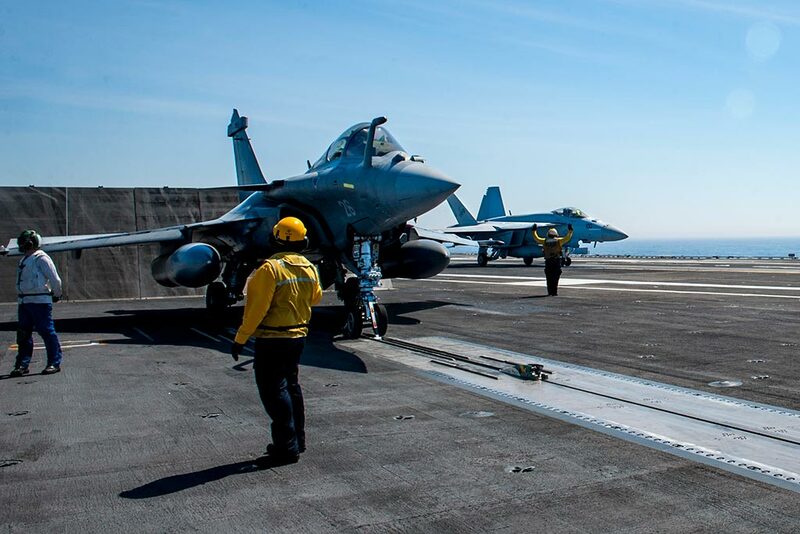 The at-sea portion of the training lasted from May 7-18 and included the French Carrier Air Wing (Groupe Aerien Embarque), Carrier Air Wing Eight (CVW) 8, and embarked staff from Carrier Strike Group (CSG) 2. 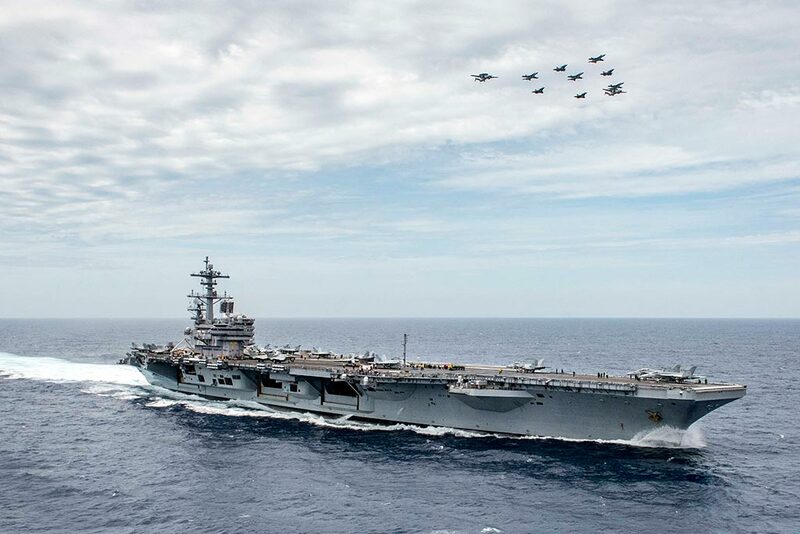 Chesapeake 2018 provided invaluable training between the U.S. and French carrier strike groups as 301 French sailors embarked aboard the CVN-77 Bush to maintain naval aviation proficiency and develop their expertise for real-world multi-national operations. Marine Nationale sailors embarked on Bush aircraft carrier to conduct carrier qualifications (CQ). A CQ is a series of arrested landings and take-offs from an aircraft carrier done regularly by squadrons to maintain their naval aviation proficiency. 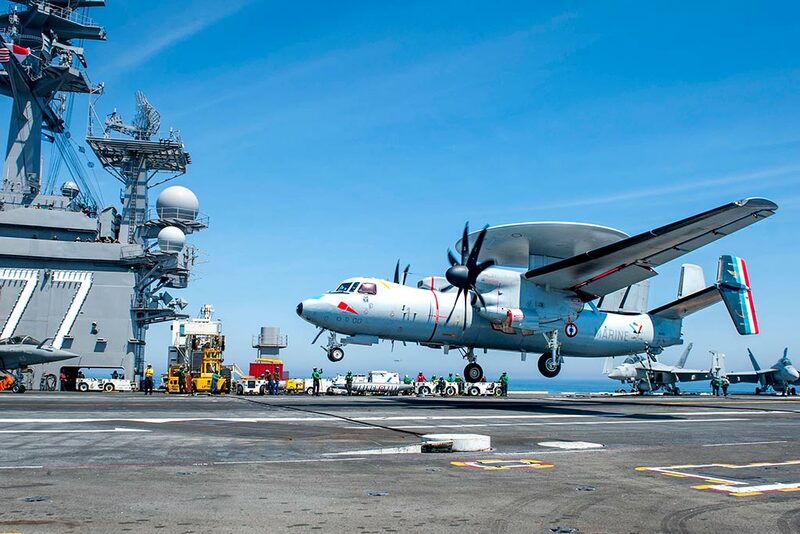 Groupe Aerien Embarque consists of one E-2C Hawkeye, 12 Rafale Marine multi-role combat aircraft, and 27 pilots looking to keep their skills sharp. The exercise presented multiple combat scenarios including cyclic flight operations and combat search and rescues in addition to completing a series of arrested landings and launches by both countries’ aircraft, totalling 458 sorties and 752 traps, which resulted in 724.5 flight hours. One of the highlights during the event was the arrival of the highest-ranking officers from each navy, Chief of Naval Operations (CNO) Adm. John Richardson, and the Chief of Staff of the French navy Adm. Christophe Prazuck. During the exercise, more than 180 training evolutions and missions were accomplished aboard the ship, demonstrating the cooperation and interoperability of both navies. Exercises like Chesapeake 2018 allow participants to develop their expertise and demonstrate current capabilities for real-world multi-national operations with NATO partners to achieve success in carrier strike group operations. Last month, both navies conducted air strikes on Syrian chemical weapons infrastructures, and in June 2016, Adm. Richardson presented the Charles De Gaulle (R-91) with a U.S. Meritorious Unit Commendation for their success of being the only non-U.S Navy entity to take command of U.S. Naval Forces Central Command’s Task Force 50 during Operation Inherent Resolve. Chesapeake 2018 is named for the historic battle of Chesapeake during the Revolutionary War during which French naval ships cut off British supply lines to General Charles Cornwallis’ army in Yorktown, Virginia. The French navy’s engagement stranded Cornwallis’ army, and less than eight weeks later he surrendered to Gen. George Washington’s Continental Army. 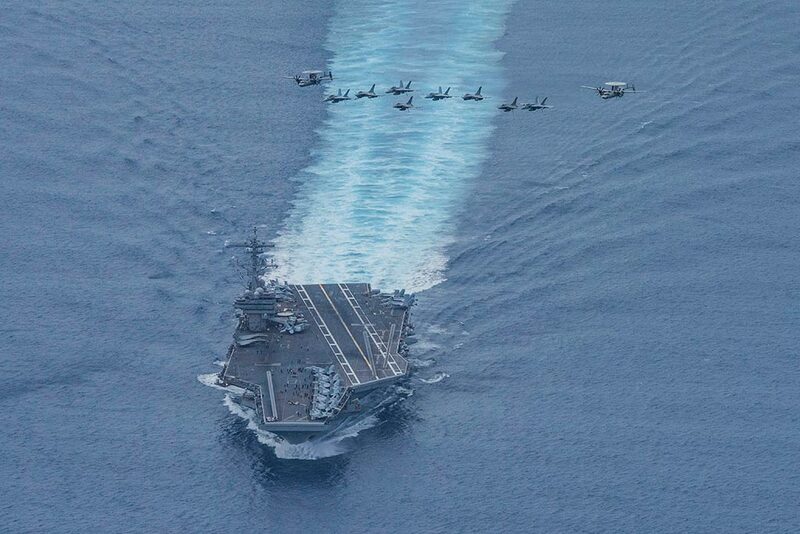 GHWBCSG was underway in the Atlantic Ocean conducting carrier air wing exercises with the French Navy to strengthen partnerships and deepen interoperability between the two nations’ naval forces. Interoperability allows combined forces to coherently and effectively achieve military objectives. By working together with allies and partners, US Navy amass the greatest possible strength for the long-term advancement of our interests, maintaining a favourable balance of power that deters aggression and supports the stability that generates economic growth.